With project revenues comprised of two parts, a Power Purchase Agreement, PPA, of typically 30 $/MWh, and Production Tax Credits, PTC, of 23 $/MWh, total revenue is as shown in the red line as 53 $/MWh. PTC exist only for 10 years from initial operation, therefore revenues before 2005 would be only 30 $/MWh. As can be seen from the black trend line, O&M costs increase with age so that at year 1995, which is 20 years from 2015, O&M costs essentially the same as revenue. In other words, there is no longer any incentive to operate the average wind-turbine project. However, for projects that signed PPAs with higher values, such as the period from 2005 through 2010 where 45 to 51 $/MWh were typical, the projects will likely operate profitably up to and perhaps beyond the 20 year mark. There is typically much moaning and hand-wringing by the anti-wind crowd because they complain that wind-turbines are not turning whenever they happen to drive by. 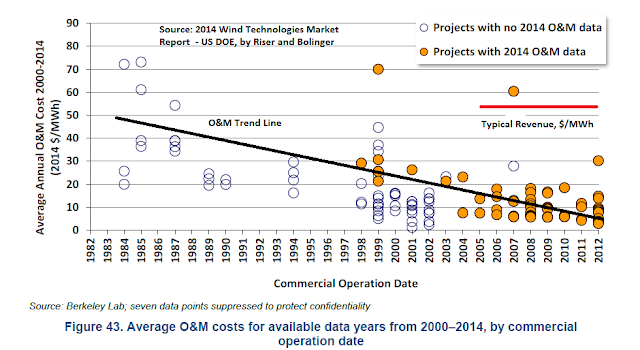 One must ask if the wind-turbines in question are older than 20 years; if so, they are likely not turning because the costs to repair and operate exceed the project revenue.